Aspire Academy bounced back from their bad-tempered defeat by Raja Casablanca to stun Glasgow Rangers, thanks to two goals by Fahad Al-Abdulla. The hosts, who had two players sent off in their opener, gave a much improved and more disciplined performance to win 3-1 against a Rangers side who had looked superb two days earlier when defeating Raja. 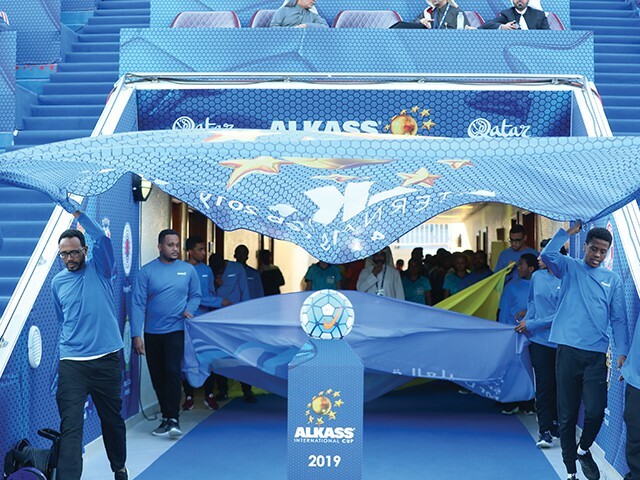 Aspire took the lead when Al-Abdulla scored at the second attempt following Mekki Tombari’s cross, and Abdulrahman AlAbdulrahman doubled the advantage after a shocking back pass by Murray Miller. Rangers pulled one back when Matt Yates netted his second goal of the tournament following great work by Arron Lyall on the wing but within minutes Aspire restored their two goal advantage after Al-Abdulla produced a nice turn and finish, with the ball going in off the upright post. Roma became the first team in this year’s tournament to win both of their group matches but the fact Kashiwa only lost by two goals means they will also progress to the quarter-finals, with 2018 champions PSG – the most successful club in the history of the competition with three wins - being eliminated. Roma have been excellent so far in the tournament and must be considered among the favourites to lift the cup. Kashiwa, last year’s beaten finalists, were the better team in the first half but Roma were much improved after the break with a fine shot by Nicola Zalewski. Roma will now face the runners-up from Group D, while Kashiwa will take on the winners of that group. Real Madrid are currently top with four points, but Suwon Samsung could leapfrog them on goal difference when they take on Spartak Moscow on Saturday. “Congratulations to the boys. I’m very happy for them. It was a very good result. We were under pressure, because of the first game that we lost, so the only result we needed, was a victory and alhamdullah, today we played a very good match with great intensity from the first minute. “The first half was not easy for us but Kashiwa are a very good side. They have plenty of quality, they are a very good possession based team. We changed our approach in the second half and we deserved the win, as we were much more in control. I am very happy for my players.